62 MMS December 2016 mmsonline.com QUALITY GAGING TIPS Columnist We have come a long way from the not-so- distant past in which surface finish was "measured" by judgment or compared to a standard with a f inger nail. 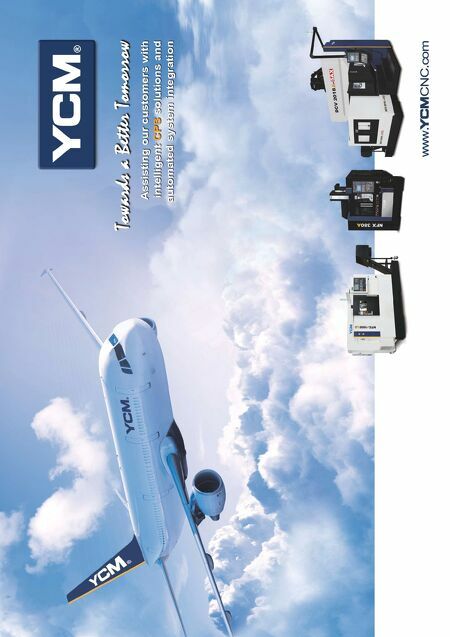 Since the ince ption of roughne ss metrology, the number of international standards and internationally recognized surface parameters has continually increased. This fact makes it par ticularly dif ficult for new employees in the quality room or in production to grasp an overview, let alone the intricacies of surface metrology. The basics of measuring a surface have been pretty consistent over the past 60 years or so. T he sur fac e m e a sur ing instr um e nt move s a precision stylus across a surface and the result- ing signal, or trace, is analyzed and presented to the user. What's different today is that there are a host of new parameters and variations to the instrument that can lead to ver y dif ferent results when different settings of the gage param- eters are used. Take filtering and cutoff lengths, for example. There are three components in the surface tex- ture trace, which are filtered to determine specific surface roughness or waviness characteristics. Depending on what filter settings are used, one can remove the waviness element to evaluate the roughness profile or eliminate the roughness elements to evaluate the waviness profile. Separating the roughness and waviness ele- ments is done using filter cutoffs. Incorrect choice of cutof f length is one of the main reasons for incorrect surface finish results. The cutoff length must be long enough to provide sufficient data for the measurement, but not so long that part geometry can impose extraneous data. A prop- erly specified cutof f usually includes 10 to 15 tool marks for most machined surfaces. But cutoff length is not to be confused with stroke or traverse length, which is the total dis- tance the probe travels, and may be 2-, 12- or even 18-inches long (50, 300 and 450 mm) in order to evaluate waviness and straightness. Detailed information about the choice of cutoffs is found in Chapters 3 and 4 of ASME B46.1. A t ypical sur face finish callout consists of many elements, all of which may be required b e c au se of th e c o m p l ex i t y of su r fac e f inis h metrology. Under the old ANSI B46.1-1985 stan- dard, a default value of 0.030 inch (0.8 mm) was applied to any surface finish callout that did not specify a cutoff. This is an effective cutoff value for many, but not all, roughness measurements. To avoid confusion and lax specifying, the new ASME B46.1-1995 standard abolishes the default and insists that all cutof fs be specif ied. It is standard procedure to measure five cutoffs within a single stroke and average the results, although fewer may be used if the surface is too short to include five. Where a manufacturing process is known to be consistent, fewer than five cutoffs may be suf ficient to generate reliable results. When reporting results, the number of cutoffs should be indicated if it is not five. 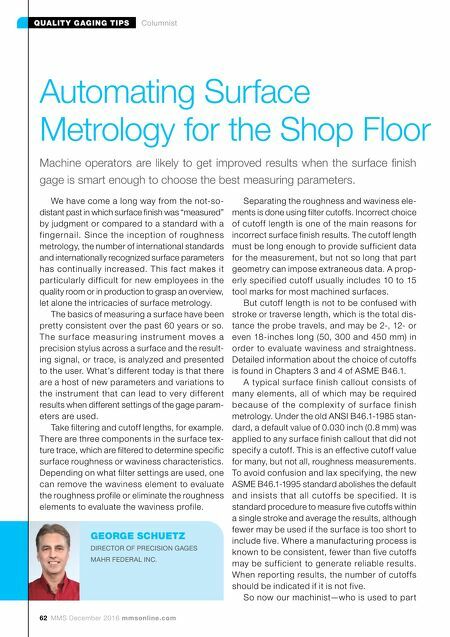 So now our machinist—who is used to part Automating Surface Metrology for the Shop Floor Machine operators are likely to get improved results when the surface finish gage is smart enough to choose the best measuring parameters. GEORGE SCHUETZ DIRECTOR OF PRECISION GAGES MAHR FEDERAL INC.